Asuka (Sawa Masaki) is a 35-year-old woman working in a fish factory and engaged to her boss Hajime Taki. Her life seems all set, but one day, Asuka walks by a lake and spots a kappa - a legendary fish creature with human form. Later in the day, the kappa again appears, this time standing in the middle of a road blocking the car driven by Asuka. Asuka gets out of the car, frightened by the kappa fish. The kappa then reveals a bombshell. 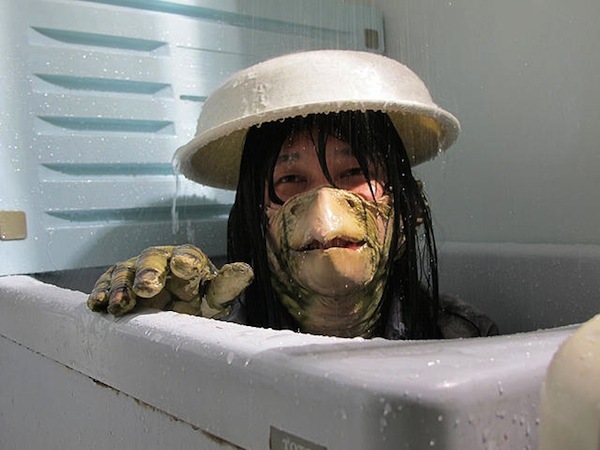 He was born as Tetsuya Aoki (Asuka's first love), but after drowning in the swamp, reincarnated into a kappa fish! Aoki also has another secret - he is still in love with Asuka! Soundtrack is composed by French indie-pop band Stereo Total. Q&A took place after a screening of "Underwater Love - A Pink Musical" at the 2011 Puchon International Fantastic Film Festival on July 16th. AsianWiki editor Ki Mun was there and transcribed/translated the session. Sawa Masaki (actress) - (speaks Korean) Hello. I am Sawa. I hope you all loved the movie. Shinji Imaoka (director) - (speaks Korean) I love you all. Moderator - To be honest with you, I liked the movie from first sight. The movie is lovely ... soft and even nonsensical. When i met the guest speakers, I could tell their free spirits were important parts to the movie. First audience question. Audience Question - I got the impression that the director enjoys films from India. At unexpected times the movie would break out into song and dance. What aspects from Bollywood films influenced this film or did you get any influence from Bollywood films? Also, does the dances have any meanings in the film? One last question for the actress - have you ever worked as a Japanese teacher in Korea? You really resemble a teacher I had. Shinji Imaoka (director) - I haven't watched many Bollywood films. I've never made a movie before which contained this much song and dance. I thought a lot about how to shoot those sequences while on the filming set. Even now, I'm a little worried whether it is OK to shoot in this way. I like movies that contain song and dance, similar to Bollywood films. I think music, singing and dancing raises people's emotions. That's why the movie ended with the singing and dancing scene so you can feel the same way. Sawa Masaki (actress) - No (I haven't worked as a teacher in Korea), please say hi to her. Audience Question - Did you practice dancing before filming the movie or did you just dance whatever you felt? If you did dance impromptu is that how you dance in your real life? Sawa Masaki (actress) - I had dance lessons 2 times. I tried my best in the dance scenes. The basic performance I got from a choreographer. Also, for the dance scene on the bridge the director demanded that I dance more cheerfully, so i tried harder. Audience Question - The cloth garment worn by the God of Death ... did you pick the outfit? Also, at the beginning of the film the screen is pink and then there is a green lotus shown. I wonder if you planned this color placement or was it just coincidental? 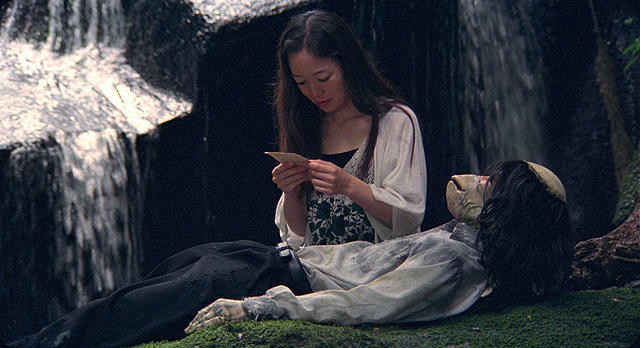 Shinji Imaoka (director) - I didn't come up with the idea for the Angel of Death's garment. At first, I thought about a basic uniform, but the actor who played the God of Death brought wigs and clothes and he wore them. So the outfit is more a reflection of his image. I didn't care much about the color in the opening sequence. I think the cinematographer (Christopher Doyle) cared a lot about the colors. Audience Question - What inspired you to make this movie? I can't get the thought out of my head that there was something missing in the movie. Is that something you intended or did it just happen that way? Also, if a co-production between Korea and Japan occured, among Korean actors who would you want to work with? Shinji Imaoka (director) - I'll answer this question seriously. A few years ago, my close friend committed suicide. I was depressed at the time and I thought about my friend a lot. While I made this movie I thought "wouldn't it be good to have my friend reincarnated as a kappa?" I didn't intend for the movie to come out that way, but it just came out naturally. Cinematographer Christopher Doyle, who is well known, might have a different view. So its a bit difficult to sort out the opinions from the filming set. Sawa Masaki (actress) - It's a difficult question to answer. I like Song Kang-Ho. I also like the film "Breathless" by Yang Ik-Jun. Audience Question - Usually in musicals, the lyrics are related to the scene or express feelings from the scene. But in this movie, the situation and lyrics didn't match. For example, the woman's life is almost over. To save her, the kappa gives her a bead. Yet, the lyrics of the song said something like "I will kill the kappa who keeps telling lies." I didn't understand that. I'm curious why you made it that way? Shinji Imaoka (director) - The soundtrack was made by German band Stereo Total. When I received the script, Fumio Moriya, who wrote the original script, also wrote the lyrics. In total he had 6 songs for the movie. For the next 2 years, the scenario changed several times. I couldn't ask him to write new songs because of the changes made. So, even though the songs didn't match the scenes we used them. Audience Question - I would like to know why you choose the kappa among many other Japanese monsters. I can't forget the emotions expressed by the kappa's eyes. He reminded me of Steven Seagal. Did you make him express his emotions through his eyes? Shinji Imaoka (director) - Firstly, about the expressions of his eyes. I didn't ask him to do anything like that. Umeja, who played the kappa, is not a professional actor. He's my friend. I think he was nervous and that's why his eyes were so intense. The idea for the kappa came from the original script written by Fumio Moriya. The first scenario was about a couple - a teacher and a student - who married. Sounding like a Japanese drama, the title was "18-year-old husband." At that time, the screenplay asked what if the high school student was a kappa. The idea of the kappa came from the first screenplay. Also, manga artist Mizuki Shigeru had kappa characters with strong sexual desires. I got the idea from that. Audience Question - I know a lot of pink films were made in the 60's & 70's. I'm curious how many are made nowadays and are they shown in theatres? At the beginning and ending of the movie I can see characteristics from cinematographer Christopher Doyle. How did you meet Christopher Doyle? Also to the actress - are you going to act in other pink films or do you want to act in other genres? If so what genres would you like to act in? Shinji Imaoka (director) - About 50-80 pink movies are made annually. It has been decreasing. About Christopher Doyle. I watched Wong Kar-Wai films before, but i didn't know Christopher Doyle personally. A German producer I knew from making a joint movie, suggested I make a film with Christopher Doyle and introduced him to me. We met for the first time 3 days before shooting began. Sawa Masaki (actress) - At first, I didn't act in the movie, because I thought it was a pink film. Regardless of the genre, I want to act. I want to work with talented people like Shinji Imaoka and Christopher Doyle. Audience Question - Pifan is a fantastic film festival. So what is a fantastic factor or scene for the director and the actress in your movie. 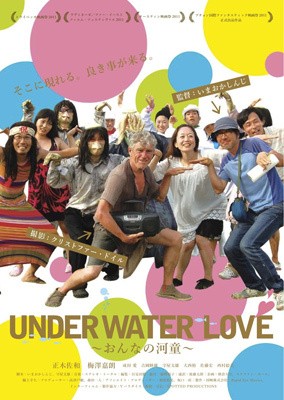 The title of the movie is "Underwater Love" and there are repeated imagery of water like the woman who works in a fish factory, the sea in front of the factory and the kappa that lives in the water. Is this just the shooting location or does it have more symbolic meaning? Also what kind of movie would you like to make going forwards and if you cast any Korean actors or actresses who would you cast? Shinji Imaoka (director) - I think the word fantastic is connected with the word amazing. I think people watch movies and get amazed & stimulated. That is a good thing. I hope people are inspired. I also think fantastic is surprising. In this movie the kappa appears. That is surprising. In the movie an old kappa comes out. He is actually a friend of mine. I often cast him for my films, but usually only for minor roles. This time around I got to cast him in a bigger role where he had to memorize lines and act for a substantial length of time. I think that is surprising. The movie location is important. We filmed in Kasumigaura, Ibaraki. I found the factory by chance. When shooting for the waterfall scene, it was the rainy season so it rained all the time. But, one day the sun shined and on that day we shot the scene. For your last question, I want to work with and meet ice skater Kim Yu-Na. I would have to make an ice skating movie.